Vol.4 is Joe Jackson's first album with his former band since Beat Crazy (1980). The new songs draw on his roots but he writes with more of an honest and less cynical approach. E.C. : Your new album «Vol. 4» goes musically back to your beginning. Was that a logical step or is it a sign of a midlife crisis (Joe Jackson will turn next year 50)? Joe: (laughs) Its none of the above. Its just a new album with 11 new songs. I couldn’t have written them 20 years ago. And we couldn’t have made this album 20 years ago. Obviously this is my original Joe Jackson band. There are things about it that will remind you of the early stuff because it’s the same guys. But that’s not really the main idea. The main idea is to do a new album, a great new album. I feel like we have done that. It has an element of nostalgia about it. But I think that’s fun. But I don’t have a midlife crisis! E.C. : Sometimes when men have a midlife crisis they return to things from their youth. They try to relive what happened then. Joe: That sounds like a terrible idea to me. E.C. : The new songs sound as fresh as your early material. Joe: I think its sounds even better. I think I improved, we all improved. E.C. : How easy can you switch Pop, Jazz and Classical music? Joe: It probably would be a problem to do that. But I have never done that. E.C. : But you have written jazzy songs! Joe: I don’t think so. Everything I ever done right from the first album was a sort of an eclectic mix of different styles. That seems to be the way that I write. I never really planned to do that. That’s just me. I have never done a Jazz record, I have never done a Classical record. I have done things that don’t fit neatly in certain categories, so people call them what they wanna call them, I guess. E.C. : But some of your albums («Nigh and day») were close to what people call Jazz. Joe: I don’t think so. There was only one album, «Jumpin’ jive», but that’s not my own music. I covered songs from Louis Jordan and Cab Calloway. So this does not count. It was fun to do. E.C. : How did feel when you played for the first with your old band again? Joe: We were a bit nervous at first. But pretty soon we were having a great time. Sometimes we had to stop the rehearsal because we were all laughing too much. We really felt that it would be good because we knew we all still could play. We are not old and horribly fat or tired. No one is really messed up on drugs and or anything like this. It worked more easily than we expected. The chemistry we had 20 years ago as a band came back. Pretty soon we were having a great time. E.C. 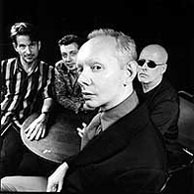 : Was it easy to convince Dave Houghton (Drums), Graham Maby (Bass) and Gary Sanford (Guitar) reform the Joe Jackson band? Joe: At first they didn’t believe me. They thought I was joking. When I convinced them that I was serious they were very enthusiastic. E.C. : How different do you approach songwriting today compared to when you started? Joe: I don’t think that I approach it differently, I just think that I am better at it today. The main difference is that I write much more from the heart now. When I started I was more trying to be clever. I was more cynical then. I think that cynicisms is a disease of youth, actually. What I am doing now is much more honest. E.C. : Can you give me an example of a song that you couldn’t have written when you started? Joe: All of them. Probably something like «Love at first light», «Blue flame», «Take it like a man» or «Fairy dust». Some of the other ones are maybe a bit closer to what we did back then. But even those are done with more…., I don’t know, I just think my craft is better. E.C. : Last year you played with your old band some warm-up gigs. Was this a kind of a test if your are still able to move the audience? Joe: I don’t know, maybe. The main reason we did the warm-up gigs was so that we could make a great album. I think its better when you play live. It would have been a bit safe otherwise. We had to play live to add the element of danger that you only get with an live audience. It took the whole thing to another level. E.C. : What can the audience expect from your live show? Joe: We gonna play old and new songs and songs from in-between. Expect nothing but be ready for everything. E.C. : So, its not gonna be a best-of show? E.C. : Actually, I couldn’t imagine you doing a best of show. Joe: We have a new album. We will play some old and have a few surprises, definitely. E.C. : In what countries are you gonna play? Joe: We are going to play allover Europe and North America. I don’t know if we are going anywhere else yet. E.C. : Looking back does the way you went musically make sense to you, or did you decide from step to step? Joe: I never had any idea what I was gonna do next. Never. It doesn’t work like that. I don’t think that any artist really has a plan. That’s not what being an artist is about. Its’ more about following your intuition. You have to work with what you got. That comes from your unconscious. There was never a plan. But it all makes sense to me. I understand why I did what I have done, more or less. But you can’t always put it into words. It’s a lot of mystery involved in making music. E.C. : That’s true! Once Townes Van Zandt told me that he puts up his radar to get his songs from the air. Kristine Hersh (Throwing Muses) told me that the songs get to her by slipping underneath her bedroom door. Joe: Its actually very difficult to explain how you write songs. E.C. : Is there something that you regret from your past, just musically? Joe: Not that much. There is nothing that I am really ashamed off. I would say that «Jumpin’ jive» in some way was a mistake. I think it just confused people to the point were people still ask me questions like «So you made a jazz album». And they think that I wrote those songs. I was a bit naïve. I think that it was okay to do something as little vacation, just for fun. And my first instrumental album «Will power» was not that great. I think I have done much better since then. Everything I have done was the best I could do at the time. I made a record thinking that isn’t very good, but I am gonna put it out and keep my fingers crossed that people don’t notice (laughs). I never did that. E.C. : Sometimes you need some distance to your songs to find out what they mean to you. Joe: This is the same for me. E.C. : What is the idea behind the album title «Vol. 4»? Joe: Well, it’s the one after «Vol. 3», that was called «Beat crazy». We made 3 album together as band and this is number 4. E.C. : Could you imagine to play the same kind of music for 40 years? Joe: That’s a kind of what I have been doing until now. E.C. : Not really. Just compare yourself with someone like Keith Richards. Joe: Oh yeah, there are some people whose style you can describe in 5 words, 3 words or even 1. Because they stay in-between smaller boundaries. That’s not better or worse, just their thing. In my case what I do is a bit broader and its very eclectic. A bit more diverse and not so easy to describe. And again, that’s just me. That’s natural for me. I never changed. So, I never felt I was changing styles. E.C. : So, you never really tried intentionally to reinvent yourself? Joe: No, not at all. I was always just following my intuition. There is an element of exploring in it. I think in a way an artist is an explorer. Part of being creative is looking for new things. But its not calculating things, it’s not you make an decision to change in a certain direction just for the sake of changing. It doesn’t work like that. At least not in my case. I can not speak for anyone else. I think my attitude is very consistent all along. And if there are differences between different projects they are like a writer doing a book of short stories and a novel. And then maybe doing some essays, and then writing another novel. Its that kind of thing. It’s a diversity of forms. But I don’t except the idea that I changed styles. I never had a style in the first place. Everything I ever did was just a mixture of different styles.